Who was the first woman to qualify as a doctor? Who is the only woman to have won two Nobel Prizes? 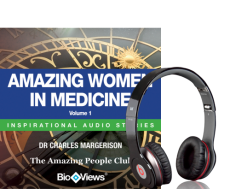 Five amazing women, five inspirational stories – explore them all in this unique audio story collection from the Amazing People Club. Medical research continues to push the bounds of possibility and it's the pioneering work of a group of talented individuals who have been responsible for major leaps forward which we all ultimately benefit from. Meet Florence Nightingale, Marie Curie, Elizabeth Blackwell, Elizabeth Garrett and Mary Edwards Walker and understand why their contributions were so crucial. You may know these names, but not the details of what they achieved within the context of their lives. A BioView® is a short biographical story, similar to an interview. These unique stories provide an easy way of learning about amazing people who made major contributions to our world.